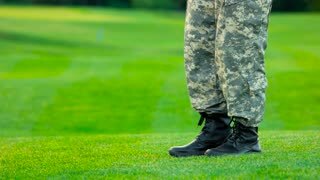 Search Results for "woman soldier"
Back view military man on date in a park lawn. Happy soldier with woman on glade, rear view. Woman stand on her toes to kiss her soldier boyfriend. Young military couple kissing each other, homecoming concept. UNITED STATES 1940s: Rear view of soldier sitting at bar / Soldier talks into phone / Woman on bed talks into phone / Closer view of woman / Soldier on phone. 1940s: Man hands out food to soldiers. Soldiers gather clothing. Soldiers wave from trucks. Cruise ship. Small military boat. Women hand out mail to soldiers. Soldier smiles and reads letter. U.S. women soldiers interact and hand out blankets to Afghan women. UNITED STATES: 1910s: man and woman shake soldier's hands. Soldier on horseback. Soldiers move carts through town. 1940s: Bedside framed photo of woman, soldier lies awake on pillow in bed. Hazy city lights. Men sleep in bunker rows of beds. 1940s: Woman looks down front of dress. Waiter looks at woman. Female soldier sits behind desk and speaks. Female soldier reads from letter. 1940s: Women hand out letters to soldiers. Men write letters on sides of wall. Soldiers wait on decks of ship. Gangplank swings into position. Soldiers walk down gangplank. 1940s: Soldiers salute and march in parade. Woman in crowd waves goodbye. Soldiers carry flags and rifles in city parade. 1940s: Men eat on boat. Man stand around and wait. Woman and soldier look at each other through binoculars. Men shout. UNITED STATES 1970s: Woman works on engine, zoom out to plane / Equipment, zoom out to operator / Woman talks into camera / Soldier with man at desk / Man at desk points / Man in warehouse / Woman behind counter / Woman typing / Woman typing. 1910s: men and woman celebrate as Northern soldiers parade past house as man in Union soldier uniform walks with girl in dress to grass lawn, sit on stones, hold hands, stand up and enter house. VIETNAM 1960s: Soldiers gather around anti-aircraft gun. Girl delivers flowers to soldiers. Soldier hugs girl and comarades clap. Men and women interact with militia. 1940s: Soldiers carry rifles and march in military parade. Men and women observe parade. Tanks roll through Moscow in parade. Soldiers stand at attention. Military officers stand at attention. 1970s: Women discuss papers at desk. Men and women talk to soldiers in various offices. Students board and walk by school buses. Students in front of school. Students at desks in classroom. 1950s: General talks with soldier, they wear Victorian uniforms. General hands quill pen and holds paper. Soldier sits, signs document. Man greets women, takes a woman by hand. Woman sits, stands up. VIETNAM 1960s: Men and women perform play on stage. Man carries machine gun off stage. Men and women talk on stage. Woman ties scarf around soldiers neck.